Red dot sights are great for self-defense, close quarters, tactical training, competition and target shooting. 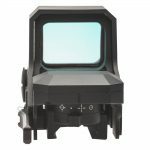 They undoubtedly make accurate target acquisition quicker and easier and you don’t need to spend nearly half a paycheck getting one of quality. There are plenty of very good red dot sights on the market for less than $200. I’m glad I’ve had the opportunity to run one. The Sightmark loaned to me was the Ultra Shot A-SPEC, (A for Advanced) MSRP $179.99. 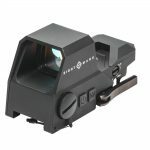 It is a compact reflex sight with 4 red reticle options, 10 brightness settings, corrected parallax beyond 10 yards, and 6 night-vision settings. The Sightmark Ultra Shot A-SPEC changed my mind about affordable red dots. I’m not going to turn down a tool that makes me quicker as well as more accurate. No shooter should. The A-SPEC’s power button and night-vision setting button. The A-SPEC has a wide angle of view. 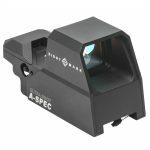 The A-SPEC is an affordable and good quality red dot sight for your AR. I mounted this on a 5.56mm AR-15 built on a Palmetto State Armory lower. Mounting is quick and easy using the quick-detach throw-lever mount. It mounts to standard Picatinny rails and locks down tight. It co-witnessed nearly perfectly with my front sight post upon mounting. No adjustments were needed. I left it on the first reticle setting—the 3 MOA dot with 30 MOA circle and crosshair and level three brightness. The included manual says settings 1 through 5 are best for outdoor; however, level 3 for me was just the right amount of brightness to get on target quickly in the indoor range without reflection and haloing. 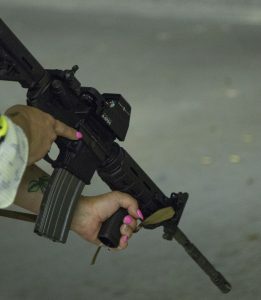 The Sightmark A-SPEC red dot sight did its job during a tactical carbine class. Most of this class was stress inducing—range orders yelled, team members yelling, running and gunning and rapid fire. We were shooting 16 rounds a time per exercise with reloading and instructional breaks in-between. The A-SPEC remained accurate and aimed consistently the entire four-hour class. Aiming with both eyes open was instinctive and actually made staying on target easier, especially when moving and shooting while having to also pay attention to my peripheral vision in order to keep up with my teammates. The lens is clear, and the illuminated reticle is bright. It worked perfectly and gave me accurate sight alignment out to the 25 yards we were shooting. The reticle adjustment knob is stiff, but not hard to move, meaning it will not accidentally move during recoil. I tried operating both the reticle knob and the digital on/off and brightness adjustment button while walking forward and backward. It was too difficult for me to make adjustments, keep my rifle at the ready and move all at the same time. Fortunately, I don’t see this being an issue in real-world applications. As long as the red dot stays on…and it did…I’m fine with that. The A-SPEC has a one-hour automatic shutoff, which is convenient and considerably saves your battery life. I know this because after a dinner break, the unit did shut off. Hence, my attempts at operating it while moving. It turns out that was a good test for both me and the sight. Operating the sight is easy. The digital button is marked with the universal “power” symbol. Push once for on and then again to go through the different brightness settings. To turn off, simply press and hold the power button for three seconds. The last two brightness settings can only be seen in complete darkness. I am especially impressed with how well the Ultra Shot A-SPEC co-witnessed accurately with my front sight and how consistently bright the reticle stayed during the entire class. One of my teammates needed to boresight his red dot in the middle of class, but mine held zero. 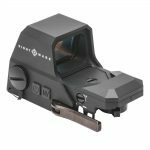 The Sightmark Ultra Shot A-SPEC is a great red dot sight, especially for the price. You can find it here.